Well here we are in the homestretch of my last pregnancy. I'm 38 weeks with Baby Tree #3 and we are all very ready to meet him. I'm feeling all those final pregnancy feelings. I definitely have discomfort, heartburn, and I'm getting up to pee 40 times in one night, but more than anything I'm so anxious to meet our baby boy. Almost eight years ago Luke and I went on our honeymoon and had a blast, but by the end of it we were so ready to go home and start our life together. Prior to our wedding we didn't live together so we had no idea what it would be like. We were enjoying our time on our first trip alone together, but the anticipation of what was ahead was so intriguing. And that's exactly how I feel now. I'm wanting to enjoy every part of this pregnancy. Those kicks and feeling the baby move all around. Feeling his hiccups and knowing that once he comes out you quickly forget just how pregnancy feels. There is really nothing like it, yes it can be miserable at times (just being honest) but it's also amazing and miraculous in every way. But while I'm trying to enjoy it, I'm also so anxious to meet our 3rd baby. Will he be blonde and blue eyed like his brother, or inherit more of his Indian genetics like his sister did? I'm ready for the kids to meet their new baby sibling and just ready for our family to be complete. Its a fine line balancing enjoying the last of the pregnancy and just being impatient about finally getting to hold him and kiss his face. So now we just wait. And while we wait I've been trying to get all the baby stuff ready. It's funny because by your third go round I feel like you actually have LESS baby stuff than you did before. Or at least that's the case for me. I've been around the block and I've realized what I need and don't need. Our house isn't necessarily overflowing with baby stuff at this point because I know just what I need at first and that's not a lot! I've had people ask me about a blog post of my favorite baby stuff so I'm going to try and get this done before the baby comes! This was the last belly shot I took about and it was two weeks ago, I've grown since then. Trust. My c-section is scheduled towards the end of the month, and for some reason I have a feeling I will make it to that date. For most of the pregnancy I thought he would come early, but I've changed my mind and I think he's pretty set in there, so I've got around two weeks left. 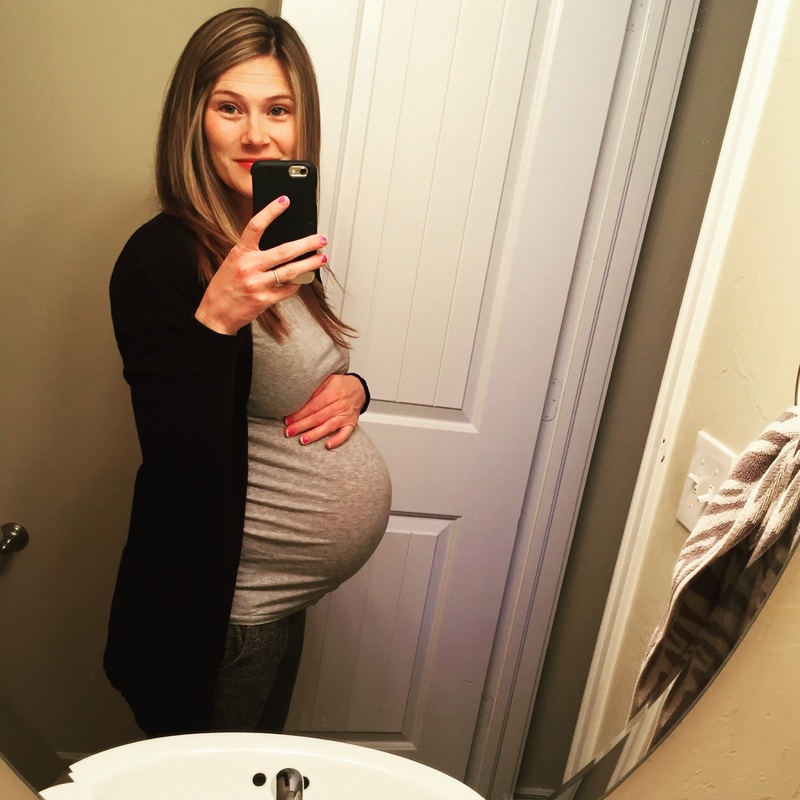 While we are so ready to meet him I will enjoy these last days, even with the discomfort and occasional pains there is still so much joy and wonder left in these last days of pregnancy. You look so cute!! Have you shared the name for sweet baby #3? You look great! I've been following your blog since before Eli and I just had my first baby boy last week. The uncomfortable pregnancy feelings and even the unplanned c-section recovery discomfort have faded already. Can't wait to see your latest addition. Congrats!